On the morning of Tuesday 19 February 2019, Erik and Jackie Moar noticed a small, grey owl sat in a spruce tree just outside their bedroom window at their home in Tumblin, Bixter, Shetland. Not recognising the bird, she took some photographs and posted them on her Facebook page. I was heading out to the central Mainland to pick up some trail cameras we’d set out along the coast last month and on the way, I received a message from a friend of Jackie’s to let me know there was an owl in a garden at Tumblin. Assuming it to be a Long-eared Owl, I messaged back to see if there were any images. About five minutes later I got another message to say it was “some kind of small, speckly owl” and a few minutes later, a screen-grab followed which stopped me in my tracks! I was looking at a picture of – yes – a Tengmalm’s Owl! I made contact immediately with Jackie to tell her what the bird was and the importance of their find. She was about to head to Lerwick and told me where her house was and more importantly where the bird was. She had an appointment to attend in Lerwick but in true Shetland spirit, kindly waited at the house. John and Dennis Coutts had seen the original Facebook post and arrived at Tumblin around the same time. Jackie greeted us and invited us in to the house where we were soon enjoying point-blank views through her bedroom window of this pint-sized stunner. The bird was sat a couple of metres off the ground, almost in full view. We put the news on the local grapevine and I also called it in to Will Soar at RBA along with detailed instructions of the viewing arrangements that Jackie had kindly offered. Shortly after, the first local birders arrived at Tumblin and were enjoying lovely views of this stunning bird. This is the fifth record of Tengmalm’s Owl for Shetland, but the first since 1912. 1912, Jan 23: Unst, caught, 23rd January, kept alive until 19th February. 1908, Jan 8: Unst, adult female, caught, 8th January. 1901, Nov 5: Sandsting, Mainland, female, shot, 5th November. 1897, Mar 14: Scalloway, Mainland, female, found dead, 14th March, now at Shetland Museum. Huge thanks to Erik and Jackie on their incredible find and for the lovely welcome. 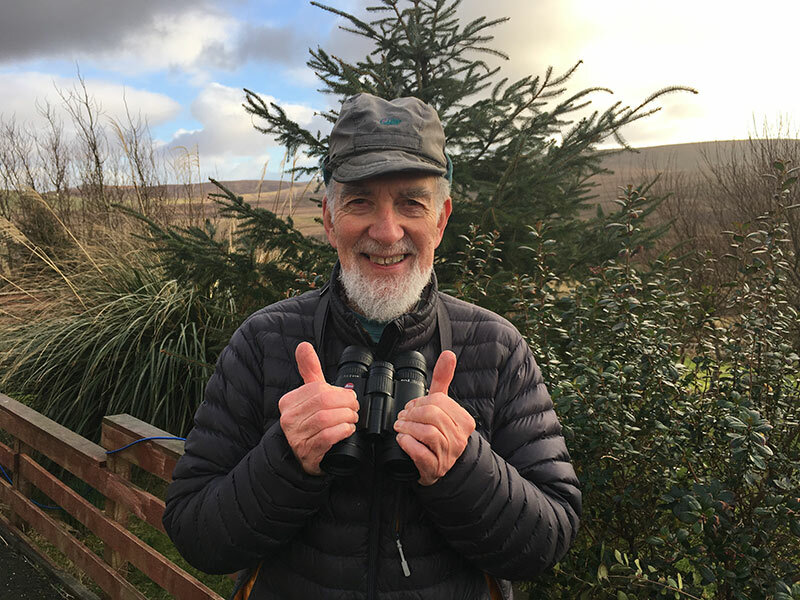 Congratulations also to ‘The Godfather’ of Shetland birding, Dennis Coutts who has now seen every species of Owl on the Scottish List. Well done Sir!